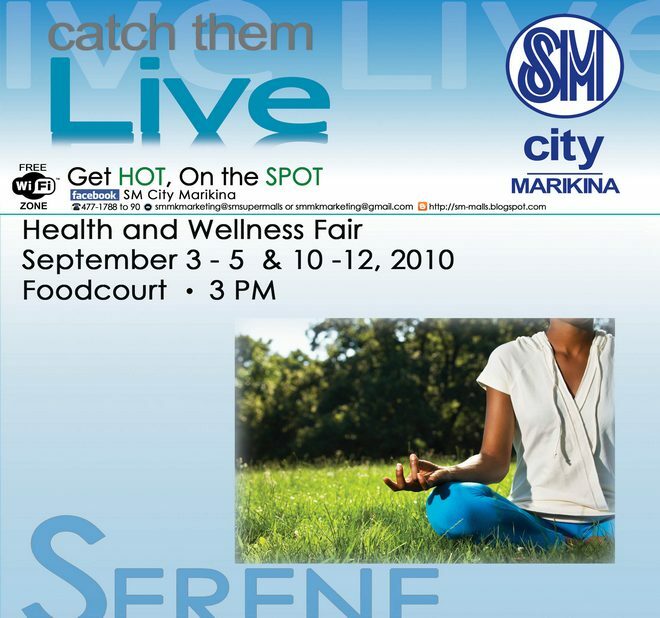 More than just good food, SM City Marikina's Foodcourt invite everyone to visit the Health and Wellness Fair on September 3-5 and 10-12. For every P150 purchase at the Foodcourt, get access to free services such as Blood Pressure reading from the Philippine Red Cross or get a 10% Discount when you present your receipt at Executive Optical. It's all here at SM City Marikina, the Hottest Venue in the East! Opening the Grandparents series of events here at SM City Marikina, dance the afternoon away with Senior's Day at the Mall. Lets us bring back the memories and also the songs of the past this September 7, 2010 4PM at the 3rd Floor Event Center. It's all here at SM City Marikina, the Hottest Venue in the East! With a treasure trove of over 400 works, Ballet Philippines’ wide ranging, eclectic repertory is unparalleled in Asia. From full-length classical ballets and internationally recognized masterworks to indigenous works of Filipino folklore and social issues, the company weaves a colorful tapestry of the Philippine’s rich and diverse cultural heritage – uniquely and distinctly Filipino. 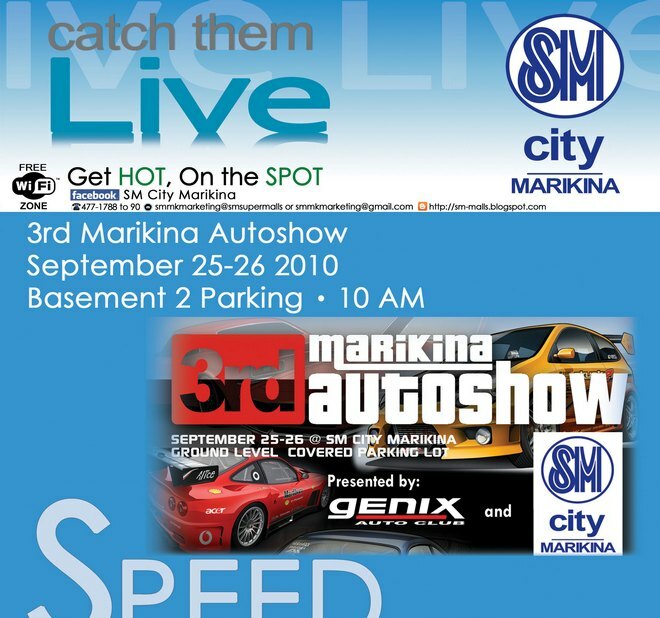 Catch them LIVE at the SM City Marikina 3rd Floor Event Center, September 11, 2010 at 4PM. It's all here at SM City Marikina, the Hottest Venue in the East! Remember Lola's secret recipe? It's about time that we return the favor as SM City Marikina Foodcourt unveils its heartwarming culinary creations that is both healthy and delectable. 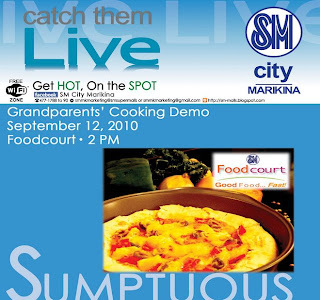 Enjoy dining while we cook up a storm this September 12, 2010 2PM at the SM City Marikina Foodcourt. See you there! It's all here at SM City Marikina, the Hottest Venue in the East! 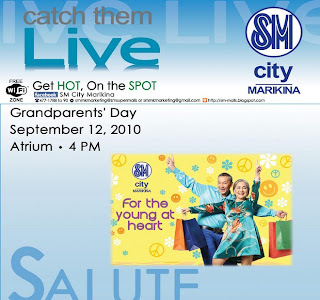 What better way to enjoy this fun Sunday with the extended family as SM City Marikina Celebrates Grandparent's Day. Our beloved Lolo and Lola will be amazed by the timeless musical stylings of our LIVE performers. September 12, 2010 4PM at the Atrium. It's all here at SM City Marikina, the Hottest Venue in the East! The moment we have all been waiting for has finally arrived! 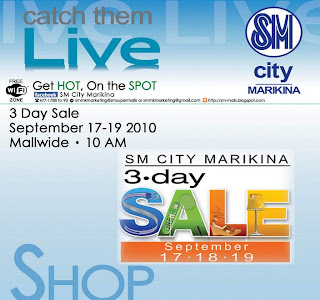 Shop 'til you drop at SM City Marikina's 3-Day Sale. Enjoy of up to 50% OFF on great finds! 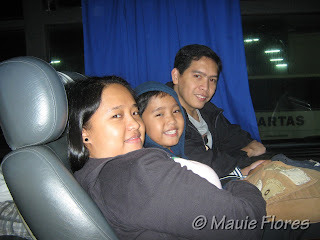 Starting on September 17-18 from 10AM to 12MN and September 19 from 10AM to 10PM. After Shopping, enjoy an evening with the 3 Day Sale Al-Fresco Concert Series! With musical numbers from Opera Belles and Sabrina. It's all here at SM City Marikina, the Hottest Venue in the East! SM City Marikina, in cooperation with Genix Auto Club with the support of the City Government of Marikina, present the 3rd Marikina Autoshow. See pumped up cars as they showcase what they are made of in this one of a kind event. From drag and engine roar contests to a special fashion show with the Genix models. Capping the festivities is the Autoshow Afterparty that is a sure fire hit! Start your engines on September 25-26 10AM at the Basement 2 Parking. For inquiries call 477.1788-90 or email smmkmarketing@gmail.com. 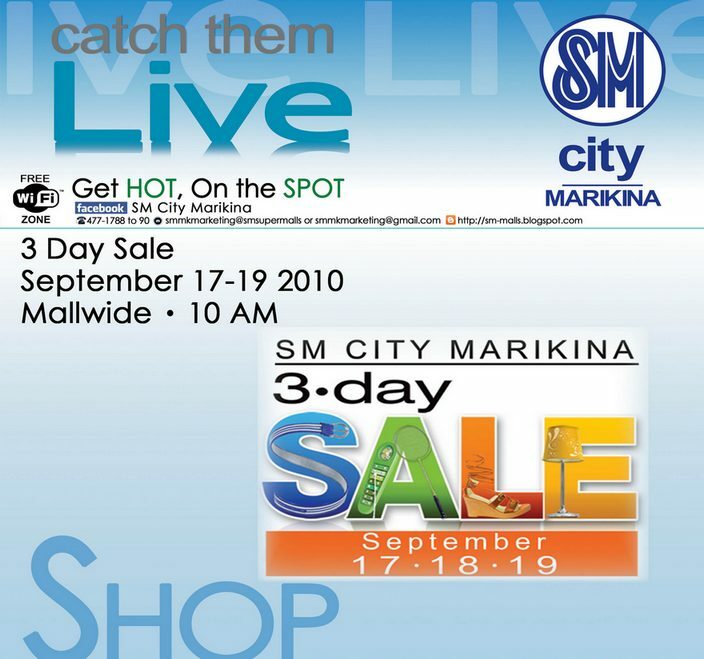 It's all here at SM City Marikina, the Hottest Venue in the East!